‘Time and Distance Overcome,’ the first essay traces the invention of the telephone and use of telephone poles to explore America’s history of racism. It’s an interesting, unusual and provocative way to approach the issue. 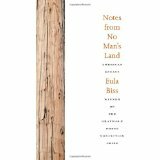 Eula Biss successfully uses her odd ball juxtapositions in many essays, which all focus on class and race inequalities. She also takes great pains to let readers know that she, despite being a privileged, highly educated and successful white woman, is not like most of her race, who largely come across as unsympathetic and callous towards poor minorities. This author is well-meaning, imaginative and her message resonates with me, since I’m a member of the black race that she so fiercely champions (she also goes to bat for other minorities). But, Biss begins to sound tiresome as she struggles with her white identity and a good many other issues over which she had, and has no control. For instance, in “All Apologies,” she writes: “The year I turned thirty, I wrote to the friend who taught me the first rule of catch and apologized for being young once. My friend did not respond.” I read that and wondered if the friend found her apology as ludicrous as I did. If you interpret ‘Land Mines’ as evidence of bias and callousness in the school system (and I assume she wants us to believe all her essays are evidential), then it is not at all obvious. I thought she tucked the ‘Land Mine’ note onto the end of the book, because she is a well-meaning person. But Biss is also a writer. To have implied that she was feeling any love from her colleagues, while struggling as a new teacher, would not have neatly fit into her theme of how poor, minority children get shafted in the New York public school system.